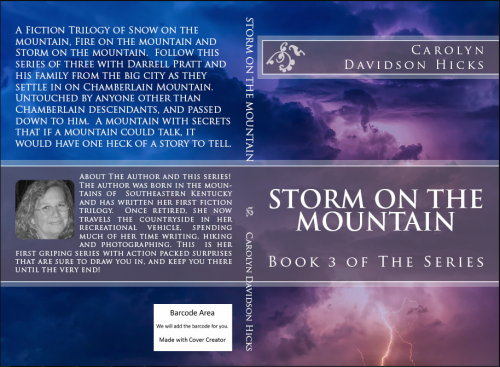 Darrell and Janette Pratt moved from the city, survived a snow storm the first month, a fire on the mountain and now rainstorms and a mystery! Are they made of the right stuff to survive? This is a story that will keep you wanting to know more! Filled with suspense and mystery, action and adventure that is sure to capture your imagination! This is the full book cover front and back before printing, it does not have the barcode but gives you an idea how the book cover looks like.